Capture is a form of violence. A debt that is based on capture is illegitimate, even if it is accepted by the political classes, where absent-minded and corrupt people cohabit. Counting only the derivatives created by the financial system, each human being’s share is $125000; and even if they’d be satisfied with just the interest, at a rate of about 3%, each human being would have to contribute, on average, with $3750 towards the fattening of the financial capital. A debt may have been contracted with the objective of satisfying an unquestionable collective need. However, the contract’s terms and conditions, or the ancillary conditions involving the acceptance of the mutual contract, may reveal clues to illegitimate elements that admit nullity or nullifying actions. The contract may include values or interest rates which are exaggerated in respect to its originating objective. It may include captious and not well clarified (by the creditor) conditions, as happens in the swaps’ case, making it difficult, in those situations, to discern careless and ignorant managerial intervention from levity bought by the banks. Non-transparent compromises or relations with the executioners of the financed works may also exist, as when contracting values above the usual rate for similar cases. Detrimental collateral effects, to people or the environment, may also occur and be despised within the scope of badly elaborated studies, or be tampered with during the execution. Finally, the mutualized capitals may come from criminal activities, from off-shores, to be conveniently laundered. · Existing bills and coins amount to $694 per human being. · Each human being supposedly has, on average, $3278 in a current account and $7264 in a savings account, which means that banks cannot ever have enough money to refund their depositors. · Debt’s total amount, including individuals, enterprises, and states, amounts to $27639 per person, but in 2008, at the start of the financial crisis, it was only $19900, thus showing that the financial system and the political class “solved” the debt situation with debt increases. · It is not possible to know the value of the obligations included in financial derivatives, but they are estimated within a large interval ($630 to $1200 billion). Taking the average point of, say, $900 billion, each human being’s share would be… $125000. It is known that the financial system works as a web, a waterfall, a house of cards in an unstable equilibrium that does not allow any stops. Just a forthright growth as demanded by Ponzi pyramids. It demands the constant, unstoppable creation of rents and financial stratagems to generate [differential] debtors and interests, in order to sustain it, and it will never be healable, as are debts between people. It either grows or dies. And Humanity can only exit this web by destroying the financial system in its current configuration, burying it with its own “credit” rights. Following this clarifying introduction, to attempt to make sustainable the effects of the financial capital’s conveniences upon the peoples is a proposal for the ab initio acceptance of its legitimacy; it is an economist, propagandistic, ideological formatting cloak towards the acceptance, as is normal, of a rent’s payment, of a perpetual contribution to capitalism’s continuity. Slave owners would deal with their slaves in a way that would keep them productive, never raising the slavery’s illegitimacy question; charity is a political model for poor’s control, and never aims to thwart the poverty’s provoking causes; and, finally, the state’s sponsored social intervention forces unemployment’s persistence or constrains poverty into docility regimes, in order to render feasible the private institutions, especially those connected with the Vatican multinational. The current pretention of keeping a perennial public debt is the same that was demanded for maintaining slavery. The capital and interest payments’ sustainability of the Portuguese debt – which, in addition, is increasing – does not exist, with or without its restructuring. No debt is legitimate if it entails the impossibility of its payment. No liquidation compromise is valid or acceptable by a people if it embodies an indebtedness without any credible payment, or reduction, perspective and, therefore, perpetual. And when that compromise comes from a political class which is docile towards the capital’s suzerainty that said political class’ can only but disappear, through emigration or jailing. The German jurist who, in the middle XIX century, strongly influenced the French legal order – Karl E. Zacharie – recognized that the compromise of debt payment cannot be missed but governments have a higher order duty than paying their creditors: that of keeping their citizens alive. And there is no alternative but to ignore the creditors’ complaints. Unsustainability, in the Portuguese case, is easily illustrated by a graphic. 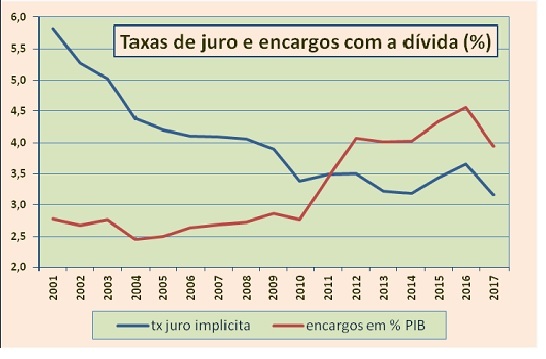 It can easily be verified, in the image below, that the Portuguese debt’s growth – before or after the troika – largely surpasses the country’s annually generated income. And changes to the current situation are not to be expected, considering the gloomy EU economic perspectives, the degree of inequalities characterizing it, with the evident segmentation between central and rich areas and others, peripheral and poor; the continuation of the Portuguese specialization in low wages, which was chosen by a business community without other qualifications than clamming to the political class for subsidies and exemptions, is not the key to a happy future. It should be added that the EU’s institutional plan is marked by an authoritarianism that fits perfectly with the national political classes’ obedience which, in essence, are framed by the PPE and S&D European oligarchies, the community or national organs being mostly occupied by individuals belonging to those oligarchies; the function of those political ornaments supporting a paltry debt restructure is to please the plebs with illusory promises and keep, in its essentiality, the financial voluptuousness that characterizes today’s capitalism. They offer lupines labeled as shrimp. Within nowadays EU’s institutional framework, the absence of a global budget or a public debt’s mutualizing project – as would be proper of a union of states with federalization tendencies – foments instead a form of crystallization into areas either benefiting or being hindered by the wealth distribution, between central and peripheral regions. The same, by the way, also happens within the nation-states, where the several territory areas are left to the market dynamics, generating deserted zones with aged population or “problematic” neighborhoods where investing is… not profitable. Within the Euro Zone, the ECB’s in pursuing its defined orthodoxy of no direct financing of the member states, has kept the quantitative easing within which it supplies the banks with liquidity in exchange for their deposit of credible guarantees, such as the public debt bonds acquired by the said banks in emissions starred by the states, thirsty as well for financing. The snake swallows its own tail. In what regards the indebted states’ populations, they have no guarantees of stable income, work, or improvement of their lives. 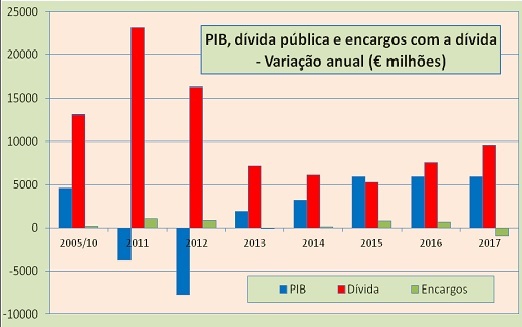 Another way to assess the Portuguese asphyxiation is respect to its public debt – and its unsustainability – between 2015 and 2016, is to admit that the debt would remain at the 2015 level and that the corresponding debt increase forecast for the current year (2016) would have been avoided by an income increase, in addition to the GDP’s plausible increase in the same year. Without excluding the relevancy of the €8433 M disbursed in 2016 and pertaining to the accumulated debt, the entire debt function included in the simulation would correspond to 12.2% of the GDP (7.5% to avoid new indebtedness accruals and 4.7% related to interest). And that is impossible to happen, even with very strong austerity levels. Other comparisons can be done. In 2016, the foreseen accrual of the public debt corresponds to about half of the VAT rent, which means that in a visit to the supermarket the equivalent of 11.5% of the shopping goes directly to the global financial system. In order to avoid new debt increases and face the obligations, it would be necessary to obtain a value higher than the revenue from the IRS (personal Income Tax). What a wonderful [finance) world! The implicit interest tax rate (obligation/global debt amount) has remained practically constant during the last years, between 3% and 3.5%, as has happened with the GDP allotment for the debt’s annual obligation payment, which is between 4% and 4.5%, if the governmental estimate for 2017 holds. Considering that debt’s global volume shows no signs of future reduction, IGCP’s activity will remain the contracting of new loans to replace others with near term dates. The future, in that context, is not auspicious, the “Portuguese will not be able to leave austerity”, as Varoufakis remarked. More recently, on December 8, 2016, the ECB announced changes to the purchase of public debt bonds which, probably, will lead to a significant increase in the interest rates of the IGCP emissions. The situation, as known, does not allow positive outlooks. Any restructuring, in essence, has to include the acceptance of the intractable conditions imposed by the EU and the IMF which hold, respectively, 21.7% and 7.7% of the total public debt. Naturally, they would have to consider Portugal within a package that would encompass other debtors such as Greece and Cyprus which, most probably, would adopt a “save yourself as much as you can” stance, without seeking a common position or solidarity. It would be much more difficult to achieve a restructuring that would include interest rates changes by the creditors, either from the financial system or private; unless, as happened with Greece in 2012, they would face a serious default threat. As was recently said, the interest rate mitigation of 1% , to be secured in Brussels, would alter the current debt’s total obligations – about €800 per inhabitant – to €748, which would not change the background situation that much. And, additionally, we point out an exercise carried out a while ago whose results are in line with those reproduced here. In ancient Rome, for instance, those slaves who would faithfully lend good services to their masters would move to the liberated category; however, subservience did not eliminate slavery. IGCP – Acronym of the Portuguese governmental Institute for the Management of the Public Credit (Instituto de Gestão do Crédito Público). The UN General Assembly’s resolution dated September 10, 2015 states that “A sovereign state has the right (…) to formulate its macroeconomic policies, including its sovereign debt’s restructuring, a right which should not be frustrated or obstructed by abusive measures, in accordance with the resolution”.